Viewpoint at Vancouver Center is a contemporary condo building located in Downtown Vancouver. Residents enjoy panoramic views of the Columbia River and Mount Hood as well as building amenities including a state of the art fitness center and deeded underground parking. 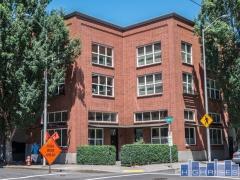 The central location is within walking distance to many restaurants, shops, and entertainment as well as a short 10 minute drive to Portland. Have any comments or questions about Viewpoint at Vancouver Center? Ask your question and/or share your thoughts about this Building.